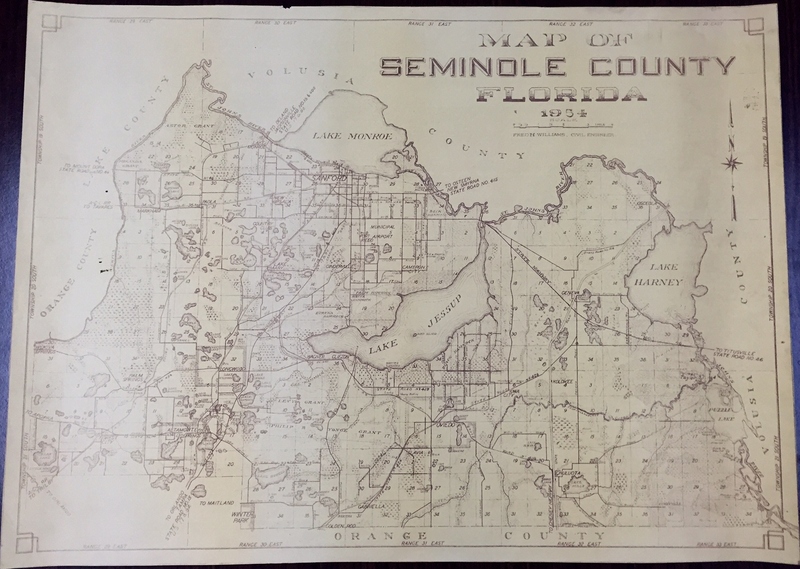 Created in 1954 by Sanford’s city engineer, Fred H. Williams, this surveyor's map depicts Seminole County, Florida. During his tenure as city engineer from the 1920s through the early 1940s, Williams created multiple maps that show how Sanford has changed as the city limits grew and the city become more populated. Unlike some of the previous maps created by Williams, there seems to be no legend detailing the map. This particular map is difficult to read due to fading. Original 30 x 22 inch map by Fred H. Williams, 1954: Museum of Seminole County History, Sanford, Florida. Digital reproduction of original 30 x 22 inch map by Fred H. Williams, 1954. Originally created by Fred H. Williams. 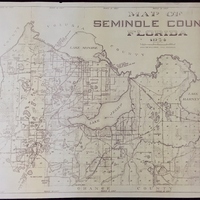 Williams, Fred H.. “Map of Seminole County, Florida, 1954.” RICHES of Central Florida accessed April 23, 2019, https://richesmi.cah.ucf.edu/omeka/items/show/6433.